Environmental regulations can require property owners to take proactive steps to protect stakeholders when site buildings are being acquired or sold. Recently, a client was in the process of selling a portfolio of multifamily apartment sites which included two, 93-yearold, three-story apartment buildings located in Minneapolis. As required by the buyer and the lender, a Phase I Environmental Site Assessment was performed at the site resulting in the identification of recognized environmental conditions (RECs). RECs included historical use of underground storage tanks containing fuel oil for heating as well as the potential for impacts from up-gradient areawide sources, which led to a Limited Site Investigation (LSI). During the LSI, Terracon collected soil gas samples from the building footprints outside and from beneath the building slabs to evaluate whether impacts were present in soil vapor and if an exposure potential existed from vapor intrusion. 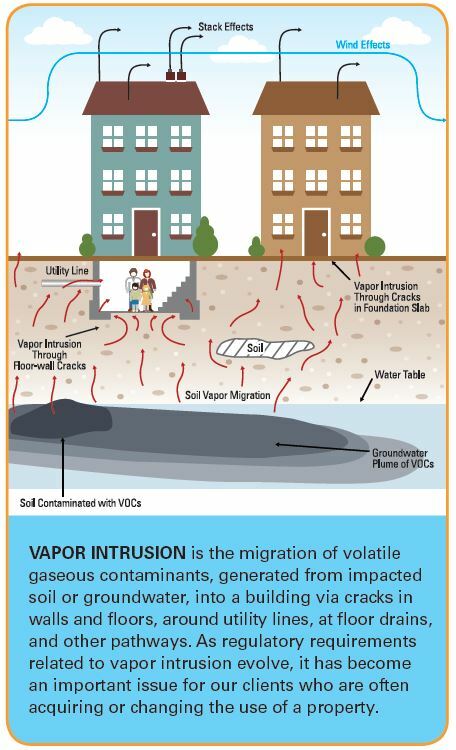 The identified concentrations of volatile organic compounds (VOCs) in soil gas exceeded regulatory risk thresholds, requiring immediate action to prevent exposure to the buildings’ occupants. A partner with the expertise and resources to develop and implement an effective solution in a challenging situation was needed. Terracon answered the call. Based on the soil gas results, the regulatory agency required mitigation of the soil vapors. Our team overcame numerous challenges on the project, which included the lack of existing building drawings, unknown footing design and layout, variability in floor slab condition and thicknesses, limited access to tenant occupied spaces, identification and abatement oversight of asbestos-containing materials, presence of lead-based paint, and the ongoing use of the site as an apartment complex. With these challenges in mind, we prepared a Response Action Plan for approval by the regulatory agency, which included an initial design and a phased pilot testing plan for a sub-slab depressurization or mitigation system. A phased approach was necessary given the buildings’ ongoing occupancy and unknown subsurface conditions. Pilot testing allowed us to assess soil conditions beneath the slabs and identify areas where vapor collection existed. We then used these results to begin a mitigation system design to vent accumulated vapors from beneath the building slabs efficiently and effectively. Our phased approach to the pilot testing revealed the need for additional suction points in occupied spaces to effectively cover the entire buildings’ footprints. The final mitigation system design included 11 suction points in the lower level of each building connected through a network of piping leading to exhaust fans installed in each of the buildings’ unused coal rooms. Vented exhaust was discharged above the third-story roofline. Post-mitigation diagnostic testing and sampling confirmed effective sub-slab air flow, decreased concentrations of VOCs beneath the building slabs, and indoor air concentrations meeting regulatory standards. Based on these results, the site was issued a No Further Action (NFA) letter from the Minnesota Pollution Control Agency with long-term system operation and maintenance required as a condition of the NFA. The system design and performance allowed our client to meet post-closing obligations as well as provide a protective environment for the occupants. Jason Gelling is a senior geologist in our Minneapolis office. He has more than 19 years of environmental consulting experience related to environmental assessment, tanks, spills, investigations of petroleum and non-petroleum impacted sites, and management of hazardous materials in various regions of the U.S.